Dominique grew up in Denton and has a passion for this community. She received her Master’s Degree in Counseling and Development from TWU in 2011. Dominique joined the SONTX family in 2016; she previously provided therapy for at-risk teens and families on both sides of adoption process. 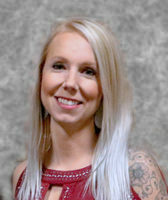 She is a member of the Denton County Family Drug Court Treatment Team. Dominique is actively involved in her church and volunteers her time in their Recovery Ministry. Dominique is happily married to an Army combat veteran. They reside in Denton with their two young children. Dominique enjoys exercising, painting, and live music.